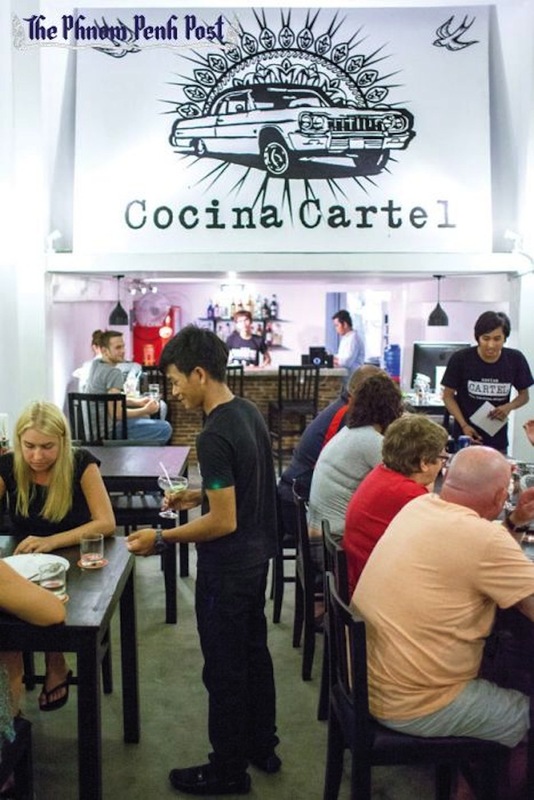 Cocina Cartel is Phnom Penh’s latest Mexican joint, and had been open for just three days when I went earlier this week. Founded by amiable Texan Matt Harp, who has lived in Cambodia for more than two years now, it sits tucked behind the Royal Palace on Street 19. Harp is still testing the waters with his concept – from the restaurant’s simple, build-your-own style menu in hip typewriter font, to its catchy branding that features an iconic lowrider car. To start with, we ordered drinks. The cocktail list comprises of the usual classics, subverted with a distinctly South-of-the-border flavour: our first round was Rio Margaritas, before moving onto Kidnapped in Juarez – Bloody Mary with an extra drop of beer, and tequila rather than vodka – and finally Border Run, a gin and tonic with four juicy lychees absorbing the gin at the bottom of the glass. Averaging at $3.50, the cocktail prices are on a par with other mid-priced restaurants and bars around the city, but the drinks exceeded the average in originality - and strength. For eating, we shared tortilla chips with homemade salsa ($3) and guacamole ($4): just what we needed to accompany our first round of drinks, though the service – filling up our water glasses when we’d got halfway down, asking what we’d like with a beaming smile and impeccable English - was so efficient that we didn’t need appetisers: our main courses arrived at the same time. I chose a shredded chicken burrito ($6), with all the extra toppings available, thank you very much (and at no extra cost, why not?). When the plate arrived - the plain white tortilla covered with green strands of lettuce, accompanied by a white bowl filled with white rice and black beans – my first thought was that the appearance of the plate could be improved, perhaps by a dollop of bright red salsa, for contrast. Superficial notes aside, the aesthetics of the meal really didn’t matter - the food is good. Somehow, the Cartel chef managed to pack all chicken, rice, beans, roasted vegetables, lettuce, cheese, sour cream, salsa and jalapenos into one compact tortilla. What the dish lacked in colour, it made up for in the combination of flavour, the salt from the jalapenos and cheese complementing the spicy chicken. My only complaint would be that there could have been more chicken in there – although, as I chose to order a ridiculous number of tortilla fillings, perhaps I’m not qualified to make that suggestion. At less than a week old, Cocina Cartel is still a work in progress. And while Harp declared himself frustrated with Mexican food in Asia, Phnom Penh is not short of Mexican restaurants. But by keeping the menu simple, welcoming diners and serving up his fine quality cocktails, Harp is doing everything right. He’s thought out his business plan so well, that when I comment on the limited space, he tells me of his grand plans to use the upper level as a roof terrace. Perhaps he’d do well to wait until the rainy season is over.